These boxes are ideal for holding your kitchen accessories, such as faucets, cabinet hardware, water purifiers and more. 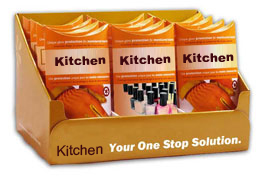 Our durable packages are guaranteed to safely hold all of your fine kitchen products. Let us help you sell the products that will help a consumer realize their new home improvement dreams. Business Image Printing is devoted to assisting you with all of your boxes and product packaging needs. If you want to improve the efficiency of your business, we can help you package your products– in any shape and form–in the most convenient and professional way. We have provided excellent printing and packaging services for a variety of industries, from food to electronics.